Most people think spring is the best time of the year. I find it the most frustrating. Summer is so close you can almost taste it. Nature dangles summer in front of you then snatches it back and throws another week of miserable winter at you. The next few weeks will be interesting. From icy coastal winds to dry desert then alpine landscapes and back to wet and cold coastal weather. This picture was shot on the coast after the tide had gone out. It is easter and we are visiting Hilde's parents. 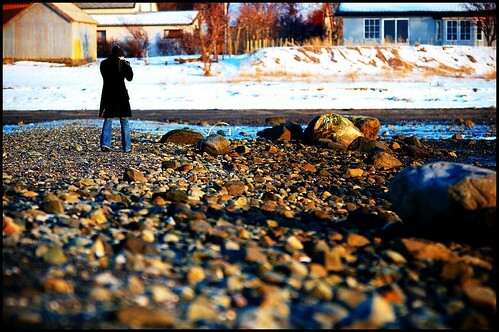 It was freezing cold, but the light was really nice, so we went outside to poke around on the beach anyway.